West Papuan activists had built a traditional Honai hut next to the Indonesian embassy in Darwin, Australia, meant to act as an embassy for the West Papuans and at the same time as a symbol of protest against the human rights abuses carried out by the Indonesian regime. However, they were evicted from the scene after their application for a cultural embassy was rejected. A group of West Papua activists has been evicted from the grounds of the Northern Territory Parliament House in Darwin after they erected a hut as an “embassy” and spent two days protesting against Indonesian human rights abuse. The group of West Papuans and Australians told Guardian Australia they had applied to the parliament for the hut to remain on the site as a cultural embassy, but the application was rejected by the NT speaker, Kezia Purick, on the grounds that it was a protest. Purick has been contacted for comment. On Tuesday afternoon the group put the structure – a traditional Honai hut – on the back of a ute and parked it outside the nearby Indonesian consulate on Tuesday afternoon, where they continued to protest. “The Honai is a symbol of the movement we have going in Australia,” said activist Peter Elaby. “Especially because elders from Larrakia [Darwin’s traditional owners] allow us to build the house, which means they welcome us and [recognise] our struggle in West Papua, which we’ve been fighting for 60 years, is not only West Papuans’ struggle,” he said. Elaby, who said he came to Australia three years ago, told Guardian Australia the group wanted to draw the attention of the government and taxpayers of Australia to the treatment of West Papua by Indonesia. More than 100 Indonesian soldiers studied in Australia last year, News Corp reported in March, at a cost of more than $2.5m to Australian taxpayers. West Papuan nationalist groups, under the banner of the United Liberation Movement, were given observer status in the Melanesian Spearhead Group at a summit last month, but not full membership. “The Melanesian Spearhead Group is recognised in the United Nations so it means our voice, our cry, is going to be listened to around the world,” said Elaby. The Indonesian president, Joko Widodo, has pledged to prioritise West Papua and improve the lives of its people, and in May released five political prisoners. Widodo also said his government would lift the decades-long ban on foreign journalists entering the region. 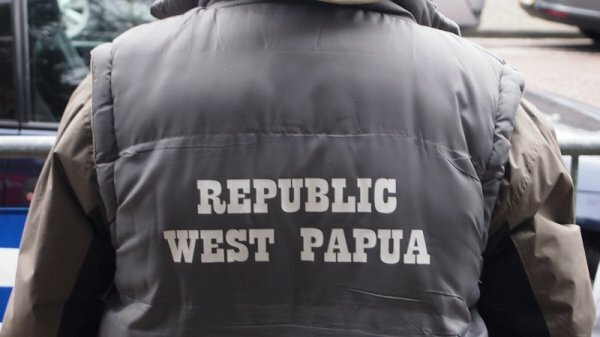 However, there have been continued reports of abuses, including Indonesian forces targeting West Papuan people and villages with mass arrests and the destruction of houses. In December, five student protesters were killed, allegedly by Indonesian forces, at a protest in Paniai. On a Pacific island tour by Indonesian foreign minister Retno Marsudi, journalists were reportedly banned from asking any questions about the province.